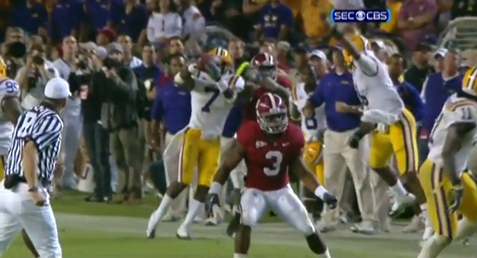 My esteemed colleague Anthony Stalter did a nice job of covering the immediate aftermath of the Alabama/LSU game, but I wanted to provide a few screenshots of Patrick Peterson’s interception that was ruled incomplete, even after replay. I watched the game as an objective observer — I didn’t really care who won, and still don’t — but this was clearly a pick and I thought the Tigers got screwed on this play. I’m not focused so much on whether or not he gets his right toe in. When I originally saw the play, I thought he clearly had possession of the ball and had his left foot in. The first shot is from behind and establishes his position relative to the sideline. The ball is in his hands and his left foot is down. The second shot is from the side. The ball is under his control and his left foot is down. The third shot is from the front. At this point, Peterson has already caught the ball and is turning it to tuck it. His left foot is clearly down and his right one may be as well. Alabama fans can rationalize it if they want — by point out earlier calls that went LSU’s way or by saying that officiating is never 100% correct. 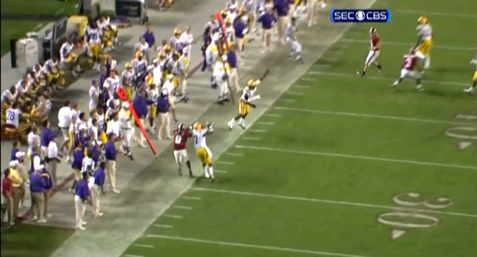 But the bottom line is that in this crucial point in the game, LSU should have been awarded the ball. It’s one thing for a linesman to blow this call in live action, but there’s no excuse for the call to stand after the replay. What’s worse, the lead official didn’t even explain why the ruling on the field was confirmed, he just said that it was and went on about his day. Did he think that Peterson didn’t have possession? Or did he think that Peterson didn’t get his foot down? Thanks to Vcize over on YouTube. I pulled these screenshots from his video of the play. I think the ref thought Julio Jones got a hand or a finger or whatever on the ball when Julio was standing out of bounds (as in your picture). According to the rules, this touching results in a dead ball, and an incompletion. Thanks for the comment — two things: 1) I don’t think Jones is touching the ball in these screenshots (or prior) and 2) if that’s what the ref thought, then he should have said that when he made the final judgment after seeing the replay. go back and watch the video and you will see that Julio clearly touched the ball while he was out of bounds. LSU Lost the game…get over it. I went back and watched the video and all I saw was Julio touching Peterson’s hand, not the ball. He may have laid a finger on it, but the video certainly didn’t show it. As an Alabama fan, you are seeing what you want to see. And if that is how the ref confirmed the call on the field, then he should have explained why it was incomplete. You can stick your ig-norant head up your big-fat as-s. You are clueless and obviously have no understanding of football. he may have had the control of the ball but you can see that Julio touched the ball and what none of us could see is if PP’s foot was on the line before he went out of bounds. The call could go either way. some say it’s an INT, others say it was incomplete. but the game is over and nothing can be done about it now. and even if lsu had got the ball they had 9 total yards of offense in the 4th quarter and they may have lost by even more with jarrett “pick six” lee at the helm and no charles scott. As an Alabama fan, I still think it was an interception. And honestly, we Bama fans would be adamant that it was an interception if the jerseys were reversed. Incidentally, I don’t remember CBS showing the replay from Pic #1, the overhead shot. A W is still a W. Roll Tide!! I’m an Auburn fan, so I am not bias. I agree that there was no clear shot of Peterson’s left foot touching or not touching the sideline. Thus, there was not enough evidence to over turn the call. Both officials on the sideline came running in signaling incomplete. One official was even pointing at the ground where Peterson’s left foot was near the sideline. Obviously, he though he was out of bounds. However, I do agree that Jones did touch the ball while out of bounds. By rule, the play was dead at that exact moment. It was the same type of play that happened a few years ago when Alabama played Ole Miss. I do think it would have been nice if the officials would have mentioned this, but they probably weren’t even looking at that. They more than likely focused on the placement of his feet relative to the possession of the ball. Nonetheless, it was the best competitive SEC game I’ve seen all year. Is the win tainted? Not in my opinion. Well, as you can see from the first picture, his foot is a ways away from the sideline. If Jones’ touching of the ball was the reasoning (and I don’t think there’s proof that he touched it) then they should have said so after “confirming” the call. In the first picture, BOTH of his feet are OFF of the ground. If there wasn’t enough evidence of Jones’ hand touching the ball (although you can see his fingers bend as the ball is pulled down by Peterson), then there wasn’t enough evidence of Peterson’s foot touching or not touching the sideline either. The left foot is clearly in bounds (the first picture indicates it’s a few inches away from the sideline and the HD replay verifies this) and whether or not Jones touched the ball is unclear. One does not have anything to do with the other. It was a bad call and an even worse job of explaining why the call on the field was verified. It doesnt matter if jones touched the ball or not. It is in possession by Patrick Peterson. You hicks need to learn what words mean. Peterson had possession of the ball. It was a blown call. Two hands on the ball left foot in never bobbles it, end of discussion. The fact that people are saying you couldnt tell if his right foot was on the line or not(which it was) is a moot point. This aint the NFL. By the way the replay booth has access to more video than just what CBS is showing. The have access to the local cable station(CST in LA case) and all of the cameras for CBS. Way to show your maturity. Obviously, you’re not seeing the images in HD. Sounds like you’re just like the replay booth… in need of a new TV. I agree with David B… and I’M AN LSU FAN!!! Also, using all caps on words DOES help to emphasize. Everyone needs to move on. Bama was the better team that day, and deserved to win. END OF STORY!!! I think it’s their year again. The D is too much for any offense out there… from coaching, to the players. The only weakness I see is Kareem Jackson. He appears to be the one that can be exploited in the passing game… IF the QB can get enough protection from Saban’s “Who’s coming next?” blitz packages. Good luck to Bama… bring it home for the west. Hey Tiger Fans. I know you are very disappointed that we didn’t come away with a victory against Alabama. However, complaining about the calls on the field, or the replay booth, is not going to change the fact that they whipped us. The beat us down like a step-child. We were not physically prepared for the challenge. It was a great play by Patrick to get into position for the INT, but we can not lay the blame on that one play for the reason of losing. Stop criticizing the Bama fans for standing by their team. You’d do the same for us. Show the mutual respect, and let’s focus on the rest of the year. We are still in a great position to make it into a BCS bowl. After all, if we take care of our business, the only 2 loses we will have will be to the 2 best teams in the land. Given how we played against both of them, Id say we should be the #3 team in the land. Thanks, and GEAUX TIGERS! Robert…not all of them. see posts above. Afrodyti, You would be correct IF P.P. had *complete* control over the ball, however at the time that Julio touched it, it looks to me like it was at the same time that P.P. went in for the catch therefore, he was not in control of the ball. Anyway, we will not agree, we both have our own opinions and you know what they say about opinions. This was not the only blow call. Go to the tigetdroppings link in one of the above post to see all of them. Julio must have arms which can extend an extra foot or two when needed to be able to be out of bounds behind Peterson who was inbounds and touch a ball that is in front of Peterson. It is common sense anyone who thinks that this is the reason for the call being upheld is reaching for excuses. Guys… Let it go. Al this rehashing the loss to Alabama is really affecting the team. We almost lost to La Tech!!! Forget about the Bama game. We weren’t good enough to win that game. They beat us FAIR AND SQUARE. Just to clear the air, and set the record straight, Julio DID touch the ball, but I wasn’t aware it killed the play. “Patrick” — It doesn’t kill the play if the ball is in your possession, which it was. Great pick!